People have been using salt in their homes for cleaning purposes for hundreds of years. There is a great reason why many people have relied on this amazing ingredient for disinfecting and cleaning various objects in the household. Yes, that is right! Salt does not provide any toxic effects. Nowadays we are able to buy salt in a very low price, which means that there is no reason why we should not use it for this type of purposes. Besides that, a lot of cleaning products which are available in markets are packed with harmful chemicals and could cause a serious damage to your health. You can count on salt if you are looking for a natural way to prevent the spread of ants. 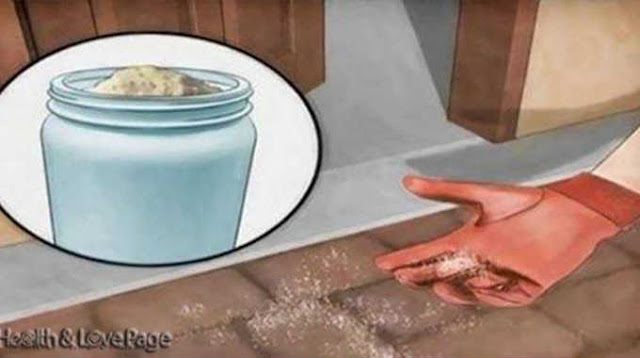 If you want to get rid of the ants from your doors, windows or storage cabinets, just sprinkle some salt in that area where you noticed them. You will also be able to reduce the level of humidity and moisture in your home if you choose to use salt in this way. Youdefinitely clean your silver, copper and brass decorations every once in a while. These types of objects tend to lose color if they are left untreated. You can use salt in order to avoid this problem. The process of polishing copper, silver or brass objects is very simple and easy. The first thing you need to do is to make a mixture of salt and apple cider vinegar. Now, the only thing left to do is to wipe the surfaces until they are shiny. You will get rid of every dirt and stain with the help of this natural mixture. Mix one gallon of lukewarm water with two tablespoons of salt. With the resulting mixture you will be able to clean your windows and remove persistent stains. Use this mixture in order to polish and clean the windows. In the end, your windows will look as they were new. The most incredible thing about this mixture is that the final effects will last for a very long period of time. Besides that, you can clean your car windows with this solution. Make a solution by mixing some salt and hot water. Use the resulting mixture directly in your kitchen or bathroom sink. The salt is able to dissolve the grease accumulation which leads to clogging and heavy smell. You can make an amazing rejuvenating bath scrub with the use of salt. The only thing you need to do is to mix salt with lavender essential oil or olive oil. Apply this solution on your body. Before you use a lukewarm water to rinse everything off, wait for a couple of minutes. You will achieve fast and efficient exfoliation because of the salt. Besides that, your skin will look young and healthy. You can use a salt-based solution if you want to revive the colors of your curtains and rugs. This solution will make them look as they are new. In order to notice the results, you will only need one wash.
Take a cloth and place it in concentrated salt water. After a short period of time, take the cloth and rub your carpets, rugs and curtains. Many people have confirmed the effects of this solution. Some people even claim that this solution is able to eliminate the dirt and stains which cannot be removed by the commercial detergents. If you experience toothaches or mouth sores, we recommend you an incredible salt treatment. All you need to do is to mix some salt and warm water. Wait for a couple of minutes for the salt to get dissolved. Rinse your mouth with this solution. This natural mouthwash will provide you with incredible results in a very short period of time. In order to create a mixture for teeth whitening, take equal parts of baking soda and salt. You are able to use this mixture anytime you want. If you want your teeth to bring back their natural shine, we recommend you to try this mixture. You will definitely achieve amazing results. If you want to protect your clothes from shrinking, pour some salt in the washing machine along with your clothes. This is especially useful if you dry your clothes out on the sun. We should also mention that your clothes will be perfectly clean and soft. This post was republished from healthandlovepage.com. You can find the original post here.